Since 2006, I have worked as an ESL and bilingual public elementary school teacher in Brooklyn, New York. 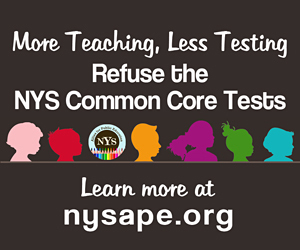 I have long been disturbed by the amount of classroom time that is lost preparing for and administering high-stakes standardized tests, however the 2013 NYS Common Core assessments were so horrific that I could no longer – in good conscience – remain passive. I have been writing about public education on this blog since then. I am an advocate for children, first and foremost, and wish to protect our youngest students from being deprived of a meaningful, authentic and well-rounded education that includes field trips, recess, music, art and access to a school library. I’m both wary and weary of education technology. I oppose the Common Core for various reasons but mostly because it is undemocratic and inextricably tied to the aforementioned tests that I – along with many other teachers – so loathe. 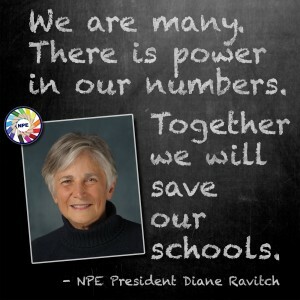 I support the Network for Public Education’s fight against corporate education reform, namely the privatization of our public schools. I’m also a parent of a child currently enrolled in a New York City public elementary school and am active with a number of #OptOut groups including NYC Opt Out and Change the Stakes. 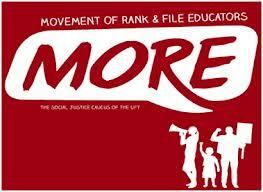 I am a proud member of MORE, the social justice caucus of the UFT. You’re so thoughtful, but we disagree on so much. At the same time, I think there is a lot of common ground. I’m interested in learning from you and sharing my perspective. Are you around next week to visit a charter school while school is out and talk about education reform? I would love to be at that meetup.